The following excerpt is from MINDFULNESS, BLISS, AND BEYOND: A Meditator's Handbook by Ajahn Brahm. In this chapter we will cover the four initial stages of meditation.You may wish to go through the initial stages quickly,but be very careful if you do.If you pass through the initial steps too quickly, you may find that the preparatory work has not been completed. It’s like trying to build a house on a makeshift foundation—the structure goes up very quickly, but it may come down too soon! You would be wise to spend a lot of time making the groundwork and foundations solid. Then, when you proceed to the higher stories—the bliss states of meditation—they will be stable. When I teach meditation, I like to begin at the simple stage of giving up the baggage of past and future.You may think that this is an easy thing to do,but it is not. Abandoning the past means not thinking about your work, your family,your commitments,your responsibilities,your good or bad times in childhood,and so on. You abandon all past experiences by showing no interest in them at all. During meditation you become someone who has no history. You do not think about where you live, where you were born, who your parents were, or what your upbringing was like. All of that history you renounce.In this way,if you are meditating with others,everyone becomes equal—just a meditator. It becomes unimportant whether you are an old hand at meditation or just a beginner. If we abandon all that history,we are equal and free. We free ourselves of some of the concerns, perceptions, and thoughts that limit us, that stop us from developing the peace born of letting go. Every part of our history is finally released, even the memory of what happened just a moment ago. Whatever has happened no longer interests us, and we let it go. It no longer reverberates in our mind. I describe this as developing a mind like a padded cell. When any experience, perception, or thought hits the wall of this cell, it does not bounce back.It just sinks into the padding and stops.The past does not echo in our consciousness. Some people think that if they contemplate the past,they can somehow learn from it and solve their problems.But when we gaze at the past we invariably look through a distorted lens. Whatever we think it was like, in truth it was not quite like that at all! This is why people argue about what happened even a few moments ago. It is well known to police who investigate traffic accidents that two different eyewitnesses, both completely honest, may give conflicting accounts of the same accident. When we see just how unreliable our memory is, we will not overvalue the past. We can bury it, just as we bury a person who has died.We bury the coffin or cremate the corpse, and it is done with. Do not linger on the past. Do not keep carrying around coffins full of dead moments.If you do,you weigh yourself down with heavy burdens that do not really belong to you. When you let go of the past,you will be free in the present moment.As for the future—the anticipations,fears, plans,and expectations—let that go too. The Buddha once said,“Whatever you think it will be, it will always be something different” (MN 113,21). This future is known by the wise as uncertain, unknown, and unpredictable.It is often useless to anticipate the future,and in meditation it is always a great waste of time. When you work with your mind,you find that it is so strange.The mind can do wonderful and unexpected things.Meditators who are having a difficult time achieving a peaceful state of mind sometimes start thinking,“Here we go again,another hour of frustration.”But often something strange happens:although they are anticipating failure,they reach a very peaceful meditative state. I recently I heard about a man on his first ten-day retreat.After the first day,he was in such pain that he asked to go home.The teacher said,“Stay one more day and the pain will disappear,I promise.”So he stayed another day, but the pain only got worse. So again he wanted to go home.The teacher repeated his instruction,“Just one more day and the pain will go.” He stayed for a third day,but the pain was even worse.Every evening for each of the first nine days he would go to the teacher and ask to go home. And the teacher would say,“Just one more day and the pain will disappear.”To his complete surprise,on the first sit in the morning of the final day,the pain disappeared and it did not come back.He could sit for long periods with no pain at all.He was amazed at how wonderful this mind is and how it can produce such unexpected results.So you cannot know the future.It can be so strange,so weird,so completely beyond what you would expect. Experiences such as this man’s can give you the wisdom and courage to abandon all thoughts and expectations about the future. When you think during your meditation,“How many more minutes are there to go? How much longer do I have to endure this?”that is just wandering off into the future.The pain could disappear in a twinkling. You simply cannot anticipate when that is going to happen. During a retreat you may think that none of your meditations were any good. But in the next meditation session you might sit down and everything becomes so peaceful and easy.“Wow!”you think.“Now I can meditate!” But then the next meditation is as awful as the first ones. What’s going on here? My first meditation teacher told me something that at the time sounded quite strange. He said that there is no such thing as a bad meditation. He was right. All those meditations that you call bad or frustrating are where you do the hard work for your“wages.”It’s like a person who on Monday works all day but gets no money at the end of the day.“What am I doing this for?” he thinks. He works all day Tuesday and still gets nothing. Another bad day. All day Wednesday and Thursday he works, and still nothing to show for it.Four bad days in a row.Then along comes Friday.He does exactly the same work as before,and at the end of the day the boss gives him his wages.Wow! Why can’t every day be a payday? Why can’t every meditation be a payday? Do you understand the simile? During the difficult meditations you build up your credit,the reason for your success. In the hard meditations you build up your strength, which creates the momentum for peace. Then when there is enough credit,the mind goes into a good meditation,and it is a payday.But you must remember that it was in the so-called bad meditations that most of the work was done. In one retreat that I gave,during an interview a woman told me that she had been angry with me all day,but for two different reasons.In her early meditations she was having a difficult time and was angry with me for not ringing the bell to end the meditation early enough. In the later meditations she got into beautiful,peaceful states and was angry with me for ringing the bell too soon. The sessions were all the same length, exactly one hour. When you anticipate the future by thinking,“How many more minutes until the bell rings?”you torture yourself.So be very careful not to pick up the heavy burden of “How many more minutes to go?” or “What should I do next?”If that is what you are thinking,you are not paying attention to what is happening now.You are asking for trouble. You are not doing the meditation. In this stage of meditation keep your attention right in the present moment,to the point where you don’t even know what day it is or what time it is. Morning? afternoon?—don’t know! All you know is what moment it is right now.In this way,you arrive at this beautiful“monastery time,”where you are just meditating in the moment.You’re not aware of how many minutes have gone or how many remain.You cannot even remember what day it is. Once as a young monk in Thailand,I had actually forgotten what year it was! It is marvelous to live in the realm that is timeless,a realm so much more free than the time-driven world we usually live in.In the timeless realm, you experience this moment—just as all wise beings have been experiencing this moment for thousands of years.You have arrived at the reality of now. The reality of now is magnificent and awesome.When you have abandoned all past and all future,it is as if you have come alive.You are here. You are mindful.This is the first stage of meditation,just this mindfulness sustained only in the present.eaching this stage,you have done a great deal.You have let go of the first burden that stops deep meditation. So it is important to put forth a lot of effort to make this first stage strong, firm,and well established. In the introduction I outlined the goal of this meditation: beautiful silence, stillness, and clarity of mind pregnant with the most profound insights.You have let go of the first burden that stops deep meditation. Now you should proceed to the even more beautiful and truthful silence of the mind. In discussing stage two it is helpful to clarify the difference between experiencing the silent awareness of the present moment and thinking about it.The simile of watching a tennis match on TV helps.You may notice that two matches are occurring simultaneously: the match that you see on the screen and the match that you hear being described by the commentator. The commentary is often biased. If an Australian is playing an American,for example,an Australian sportscaster is likely to provide a very different commentary from an American one.In this simile,watching the TV screen with no commentary stands for silent awareness in meditation, and paying attention to the commentary stands for thinking about it.You should realize that you are much closer to truth when you observe without commentary,when you experience just the silent awareness of the present moment. Sometimes we assume it is through the inner commentary that we know the world.Actually,that inner speech does not know the world at all. It is the inner speech that spins the delusions that cause suffering. Inner speech causes us to be angry with our enemies and to form dangerous attachments to our loved ones. Inner speech causes all of life’s problems. It constructs fear and guilt, anxiety and depression. It builds these illusions as deftly as the skillful actor manipulates the audience to create terror or tears.So if you seek truth,you should value silent awareness and,when meditating,consider it more important than any thought. It is the high value that one gives to one’s own thoughts that is the main obstacle to silent awareness.Wisely removing the importance that one gives to thinking,and realizing the greater accuracy of silent awareness,opens the door to inner silence. An effective way to overcome the inner commentary is to develop a refined present-moment awareness.You watch every moment so closely that you simply don’t have the time to comment about what has just happened. A thought is often an opinion on what has just happened: “That was good.”“That was gross.”“What was that?”All of these comments are about the previous experience.When you are noting or making a comment about an experience that has just passed, you are not paying attention to the experience that has just arrived.You are dealing with old visitors and neglecting the new arrivals. To develop this metaphor,imagine your mind to be a host at a party, meeting the guests as they come in the door.If one guest comes in and you start talking with this person about this or that, then you are not doing your duty of paying attention to every guest who enters.Since a guest comes in the door every moment, you must greet each one and then immediately greet the next.You cannot afford to engage even in the shortest conversation with any guest,since this would mean missing the one coming in next. In meditation, experiences come one by one through the doors of our senses into the mind.If you greet one experience with mindfulness and then start a conversation with it,you will miss the next experience following right behind. When you are perfectly in the moment with every experience,with every guest that comes into your mind,then you simply do not have the space for inner speech.You cannot chatter to yourself because you are completely taken up with mindfully greeting everything just as it arrives. This is refining present-moment awareness to the level that it becomes silent awareness of the present in every moment. In developing inner silence you are giving up another great burden.It is as if you have been carrying a heavy rucksack on your back for thirty or fifty years continuously,and during that time you have wearily trudged for many,many miles.Now you have had the courage and found the wisdom to take that rucksack off and put it on the ground for a while.You feel so immensely relieved,so light,and so free,now that you are unburdened. Another useful technique for developing inner silence is recognizing the space between thoughts,or between periods of inner chatter.Attend closely with sharp mindfulness when one thought ends and before another thought begins—there! That is silent awareness! It may be only momentary at first,but as you recognize that fleeting silence you become accustomed to it.And as you become accustomed to it,the silence lasts longer.You begin to enjoy the silence, once you have found it at last, and that is why it grows.But remember,silence is shy.If silence hears you talking about her,she vanishes immediately! It would be marvelous for each one of us if we could abandon all inner speech and abide in silent awareness of the present moment long enough to realize how delightful it is.Silence is so much more productive of wisdom and clarity than thinking.When one realizes that,silence becomes more attractive and important.The mind inclines toward it,seeks it out constantly,to the point where it engages in the thinking process only if it is really necessary,only if there is some point to it.Once we have realized that most of our thinking is really pointless,that it gets us nowhere and only gives us headaches, we gladly and easily spend much time in inner quiet. This second stage of the meditation, then, is silent presentmoment awareness. We may want to spend much time developing just these first two stages,because if we can reach this point,we have come a long way indeed in our meditation. In that silent awareness of “just now,”we experience much peace,joy,and consequent wisdom. If we want to go further, then instead of being silently aware of whatever comes into the mind,we choose silent present-moment awareness of just one thing.That one thing can be the experience of breathing,the idea of loving-kindness (mett›), a colored circle visualized in the mind (kasi˚a), or several other less common focal points for awareness.Here I will describe silent present-moment awareness of the breath. Choosing to fix one’s attention on one thing is letting go of diversity and moving to its opposite, unity. As the mind begins to unify and sustain attention on just one thing, the experience of peace, bliss, and power increases significantly.Here we discover that the diversity of consciousness is another heavy burden. It is like having six telephones on your desk ringing at the same time.Letting go of this diversity and permitting only one telephone (a private line at that) on your desk is such a relief that it generates bliss.The understanding that diversity is a heavy burden is crucial to being able to focus on the breath. If you have developed silent awareness of the present moment carefully for long periods of time, then you will find it quite easy to turn that awareness onto the breath and follow that breath from moment to moment without interruption.This is because the two major obstacles to breath meditation have already been overcome.The first of these two obstacles is the mind’s tendency to go off into the past or future,and the second obstacle is inner speech.This is why I teach the two preliminary stages of present-moment awareness and silent present-moment awareness as a solid preparation for deeper meditation on the breath. It often happens that meditators start breath meditation when their minds are still jumping around between past and future,and when awareness is being drowned out by inner commentary.Without proper preparation they find breath meditation difficult,even impossible,and give up in frustration.They give up because they did not start at the right place. They did not perform the preparatory work before taking up the breath as a focus of their attention. However, if your mind has been well prepared by completing these first two stages, then when you turn to the breath you will be able to sustain your attention on it with ease.If you find it difficult to attend to your breath,this is a sign that you rushed the first two stages.Go back to the preliminary exercises.Careful patience is the fastest way! When you focus on the breath, you focus on the experience of the breath happening now. You experience what the breath is doing, whether it is going in, going out, or is in between. Some teachers say to watch the breath at the tip of the nose, some say to watch it at the abdomen,and some say to move it here and then move it there.I have found through experience that it does not matter where you watch the breath.In fact it is best not to locate the breath anywhere.If you locate the breath at the tip of your nose then it becomes“nose awareness,”not breath awareness,and if you locate it at your abdomen then it becomes “abdomen awareness.” Just ask yourself right now:“Am I breathing in or breathing out? How do I know?”There! The experience that tells you what the breath is doing,that is what you focus on.Let go of the concern about where this experience is located.Just focus on the experience itself. A common problem at this stage is the tendency to control the breathing, and this makes the breathing uncomfortable. To overcome this difficulty,imagine that you are just a passenger in a car looking through the window at your breath.You are not the driver,nor a backseat driver. So stop giving orders, let go, and enjoy the ride. Let the breath do the breathing and simply watch. When you know the breath is going in or going out for about one hundred breaths in a row,not missing one,then you have achieved what I call the third stage of this meditation,which involves sustained attention on the breath.This again is more peaceful and joyful than the previous stage.To go deeper,you aim next for full sustained attention on the breath. The fourth stage occurs when your attention expands to take in every single moment of the breath.You know the in-breath at the very first moment,when the first sensation of inbreathing arises.Then you observe as those sensations develop gradually through the whole course of one in-breath, not missing even a moment of the in-breath.When that inbreath finishes, you know that moment.You see in your mind that last movement of the in-breath.You then see the next moment as a pause between breaths,and then many more moments of pause until the outbreath begins.You see the first moment of outbreathing and each subsequent sensation as the out-breath evolves, until the out-breath disappears when its function is complete.All this is done in silence and in the present moment. You experience every part of each in-breath and out-breath continuously for many hundred breaths in a row.That is why this stage is called full sustained attention on the breath.You cannot reach this stage through force,through holding or gripping.You can attain this degree of stillness only by letting go of everything in the entire universe except for this momentary experience of the breath happening silently.Actually“you” do not reach this stage, the mind does.The mind does the work itself. The mind recognizes this stage to be a very peaceful and pleasant place to abide, just being alone with the breath. This is where the doer, the major part of one’s ego,starts to disappear. One finds that progress happens effortlessly at this stage of meditation.We just have to get out of the way,let go,and watch it all happen. The mind will automatically incline, if we only let it, toward this very simple,peaceful,and delicious unity of being alone with one thing,just being with the breath in each and every moment. This is the unity of mind,the unity in the moment,the unity in stillness. The fourth stage is what I call the“springboard”of meditation,because from it one may dive into the blissful states.When we simply maintain this unity of consciousness by not interfering, the breath will begin to disappear.The breath appears to fade away as the mind focuses instead on what is at the center of the experience of breath, which is awesome peace,freedom,and bliss. At this stage I introduce the term “beautiful breath.” Here the mind recognizes that this peaceful breath is extraordinarily beautiful. We are aware of this beautiful breath continuously,moment after moment,with no break in the chain of experience.We are aware only of the beautiful breath,without effort and for a very long time. Now as I will explain further in the next chapter, when the breath disappears,all that is left is“the beautiful.”Disembodied beauty becomes the sole object of the mind.The mind is now taking the mind as its own object.We are no longer aware of the breath, body, thought, sound, or outside world. All that we are aware of is beauty, peace, bliss, light, or whatever our perception will later call it. We are experiencing only beauty, continuously, effortlessly, with nothing being beautiful! We have long ago let go of chatter, let go of descriptions and assessments. Here the mind is so still that it cannot say anything.One is just beginning to experience the first flowering of bliss in the mind.That bliss will develop, grow, and become very firm and strong. And then one may enter into those states of meditation called the jhanas. I have described the first four stages of meditation. Each stage must be well developed before going on to the next. Please take a lot of time with these four initial stages,making them all firm and stable before proceeding.You should be able to maintain with ease the fourth stage,full sustained attention on the breath, during every moment of the breath without a single break for two or three hundred breaths in succession.I am not saying you should count the breaths during this stage;I am just giving an indication of the approximate span of time that one should be able to stay in stage four before proceeding further. In meditation, as I indicated earlier,careful patience is the fastest way! 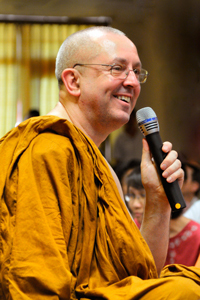 This article is excerpted from Brahm, Ajahn. Mindfulness, Bliss, and Beyond: A Meditator's Handbook. Boston: Wisdom Publications, 2006. 1-18. Print.